A smart thermostat? Smart light switches? Amateur hour. If you really want to up your smart-home game, it’s time to get serious, and the Wink Relay is one savvy way to do it. 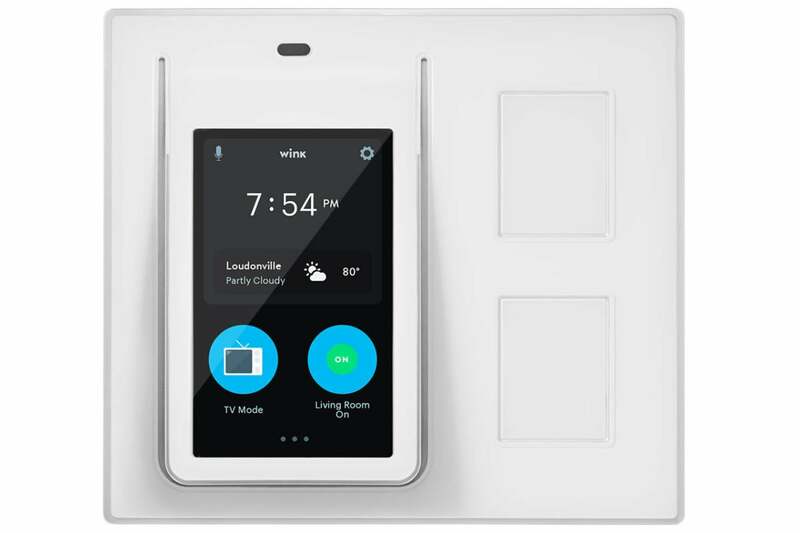 At its most basic, the Wink Relay is an in-wall, Wi-Fi-networked touchscreen controller for your Wink smart-home network. 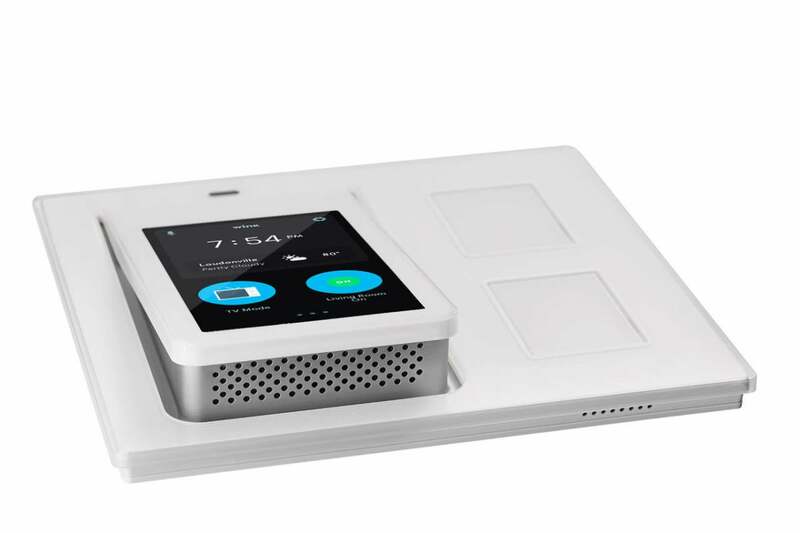 The 4.3-inch touchscreen that looks and works a lot like the Wink app on your smartphone is the centerpiece, and you can use this to control any of the devices on your Wink network. But wait, there’s more! Beneath the touchscreen is an intercom system. If you have multiple Relays (they’re sold as a two-pack), you can talk to other rooms in the house, just like it was 1983. The Wink Relay’s intercom speaker juts out from the wall, while putting the touchscreen at a slight upward angle. That’s a ton of features, but to get any of them to work, first you’ll have to install the thing in the wall. This was a bit of a challenge, in part because first I had to find a compatible light switch to replace. The Relay doesn’t work with three-way circuits, and the most appealing candidates to locate Relays in my house were all on three-way circuits. The Relay also requires the presence of a neutral wire in the junction box, which is not a given—especially in older homes. Finally, the existing switch can't be wired to an AC outlet. Eventually I found alternate homes for two Relays, but they weren’t 100-percent ideal. Installation can be a bit of a chore. Unlike a traditional switch, the Relay has pigtail wires with dedicated push-in connectors on the end of each. 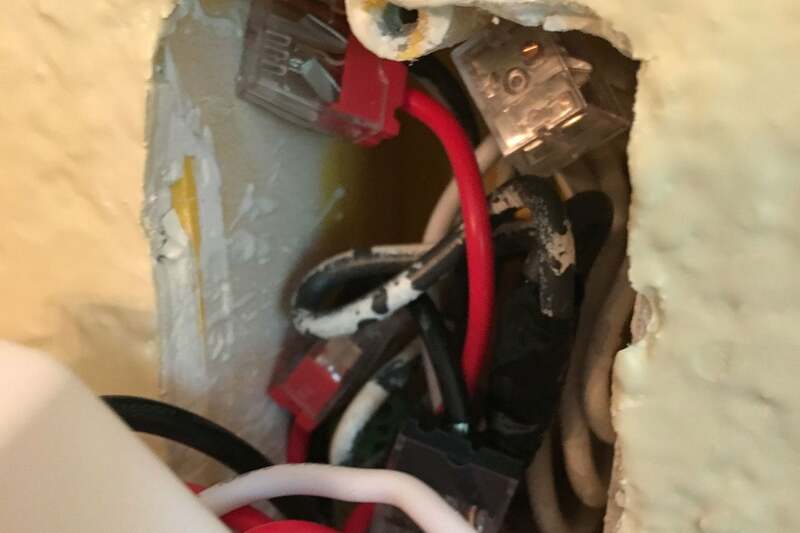 After you unwire your old light switch, you push the ends of the old wires into those connectors, which leaves you with quite a bit of spaghetti to deal with afterwards. Wink suggests installing the Relay in a two-gang junction box instead of a one-gang box, and it’s easy to see why: There’s so much hardware to deal with that jamming it all back into the box in the wall can be a real puzzle (and requires some serious muscle, to boot). …but this is the reality you'll encounter with the typical one-gang junction box. Attaching the faceplate, which connects the touchscreen to the electrical box underneath via built-in contacts, proved surprisingly challenging as well. I spent about 30 minutes on the physical installation of the first unit, 20 minutes on the second. Fortunately, luck went my way and everything worked the first time out. With the device physically attached, it’s time to get the software up and running. The touchscreen walks you through most of this, asking for your Wi-Fi network account info, your Wink account (remember, this only works with the Wink Hub or Wink Hub 2), plus some information about what exactly the Relay is attached to. After 30 minutes of system updates and optimizations, the Relay was ready to use. You can do just about anything via the Relay that you can do with the Wink smartphone app, except add new devices or make changes to existing ones—such as setting up schedules for lights. That’s fine, because I’d rather not stand in front of a light switch to configure the minutiae of my network. That said, I probably won’t ever use it to call for an Uber, either. 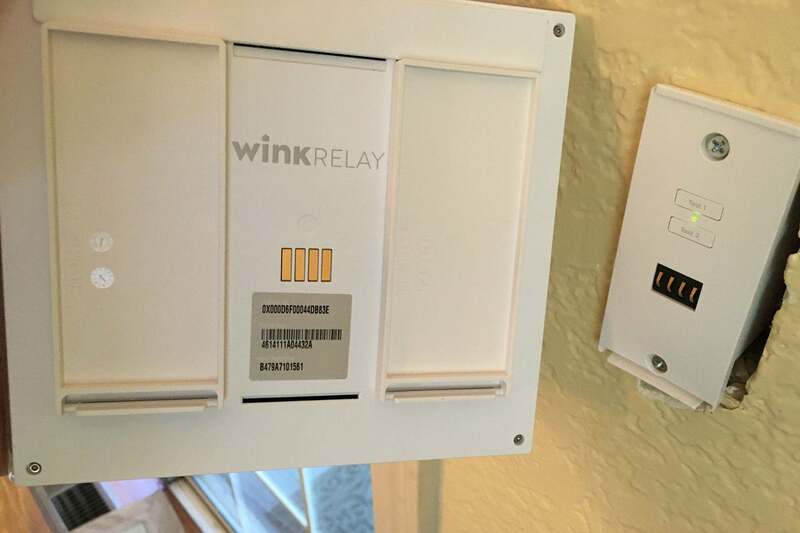 The Wink Relay's brains are in a box that goes inside the wall. Its touchscreen and buttons are on a plate that mounts to the box. At first, I was pleased with the Relay’s performance. The physical switches are responsive. The intercom is handy for calling the kids down for dinner (but less handy when they use the intercom on the other end to holler back), and the ability to create customized shortcuts on the touchscreen also gives it extra utility—though mainly I have used it for moments when, say, I forgot to shut the lights off in another part of the house. That said, the Relay isn’t perfect. The installation lets you center the touchscreen on the electrical box, or attach it on one side, which is a necessity given how close many light switches are to a door jamb. The problem: When I installed it off center I couldn’t get it to sit flush against the wall. (I ended up solving this crudely with some felt furniture pads stuck to the back of the device.) As well, I encountered a bug where the touchscreen shortcut buttons bizarrely didn’t work if I deleted the Uber shortcut. (Solution: Restore the shortcut.) I figure the latter of these will be remedied with software updates. The first issue may prove more troubling to fix, however, unless the Relay’s electrical box is shrunk down. Over time, I experienced additional trouble with the Relay, with physical buttons failing to respond, abrupt reboots (not a speedy process), and—most memorably—one full-on crash that culminated in a screen full of error codes and the Relay playing a snippet of the ‘80s classic “Jessie’s Girl” from its speaker on endless repeat. The error, encountered late at night, stands as one of the most surreal tech problems I’ve ever encountered. For its part, Wink says it is aware of some issues and is addressing them with firmware updates. I suggest buyers use caution until Rick Springfield retires. 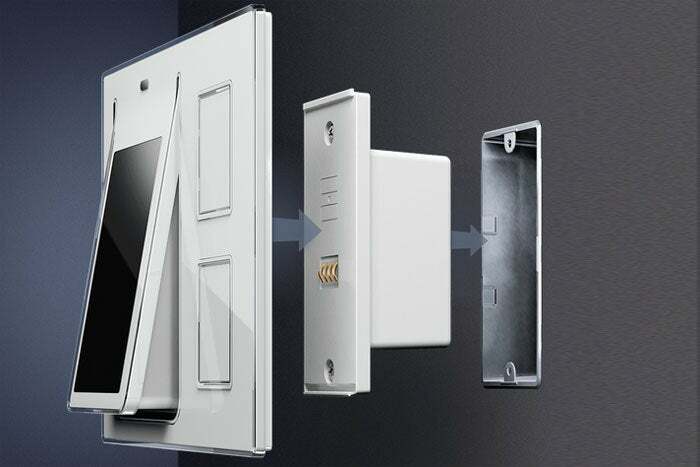 The intercom goes ultra-high-tech with this snazzy switch system from Wink.